Initially, we will inspect the whole premises thoroughly inclusive of roof and carry out the remedial treatment if activity of subterranean termite is noted. This method of termite control is widely used, which consists of the introduction of a toxic dust into the termite tunnel system. The worker termites pick up the very fine particles of the toxic dust on their legs and on other parts of their bodies and during the trips back to the nest, they groom and feed each other and thus, transfer the toxic action of the dust and eaten by the living workers during their scavenging duties and again pass the toxic elements around. However, this mode of treatment is not permanent and does not guarantee that fresh re-infestation of termites will not occur. As such, we strongly recommend that a more permanent and effective method of control be carried out. This method is known as the “CORRECTIVE OR POST-CONSTRUCTION” Treatment. 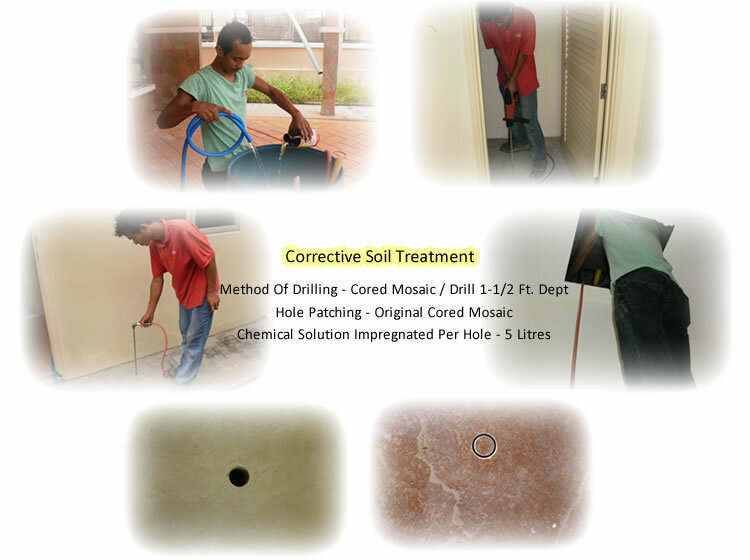 The objective of this treatment is to termite-proof a building against subterranean termite infestation by creating a termicidal barrier of up to 40mm thick around the perimeter ground beams and columns of the building. In order to reach the soil under slab on ground building, it is necessary to drill holes through the slab to inject termicidal fluid. Drilling is accomplished by a heavy-duty “Rotary-Hammer” drill type and holes of 20mm diameter are usually drilled. The holes are drilled just over 150mm from the vertical wall and these holes are spaced 450mm apart. Where it is impossible to trench on the outside of the foundation wall due to a concrete or other solid covering, then this must be drilled also. Internal foundation walls, or any wall extending downwards into the soil will be treated in the same way as given above by spaced drilling and injection of insecticide. 10 liters termiticide at the correct concentration will be injected under pressure into each hole so drilled. After injection, the drilled holes will be filled either with a cement mix or some other similar suitable material and then colored to match the general appearance of the surface. 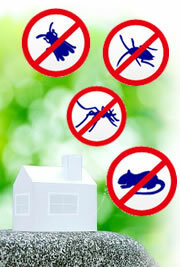 On completion of the job, ALL-PEST will issue a certificate of warranty. We will also undertake annual inspection free of charge during the warranty period. Spot powder treatment and where necessary, re-inforcement of the termiticidal barrier at the location will be carried out free of charge should fresh infestation be detected. Any extension to the building must be notified to the company and the land upon which the extension is build, must be treated by the company. Failure to make such notification and treatment will invalidate this warranty. The active ingredient Imidacloprid is readily bio-degradable. It undergoes degradation in the environment and in waste treatment plants. Degradation occurs both aerobically and anaerobically, as well as abiologically. In the environment Imidacloprid is not mobile but is strongly absorbed to soil.